Jeg ønsker av naturlige grunner ikke å dele nettverk med hybelboeren, men vil ikke drille flere hull i vegger og gulv enn nødvendig. Kabalen blir ytterligere komplisert når jeg må forholde meg til hvor internett kommer inn i huset, og tidligere snekkerier. Løsningen innebar et et besøk av en nettverks-ekspert, og jeg lærte mye på kjøpet. Eksemplet mitt viser at det ikke trenger å bli veldig avansert før vi må tilkalle eksperter. Hva gjør de som ikke har tilgang på dem? The instructions on the pirate website suggest to use nmap (the port scanner) to find the IP. Even used carefully, it is not a very popular tool in a corporate IT environment. I could have used it, but risked setting off an alarm somewhere. The journalist was arriving in five minutes, and I had no idea how to SSH to the box so that I could demonstrate the one-line «docker run» command and get a web server running. The helpful guys at corporate IT located the IP-address after I asked for help. But there should be an easier way! The Interview and demo went fine. But I am no stranger to this situation: I have given a ton of IoT-related demos with Raspberry Pi the last couple of years, and I always had to carry with me a small HDMI display and keyboard/mouse just to obtain the IP address at a new site. 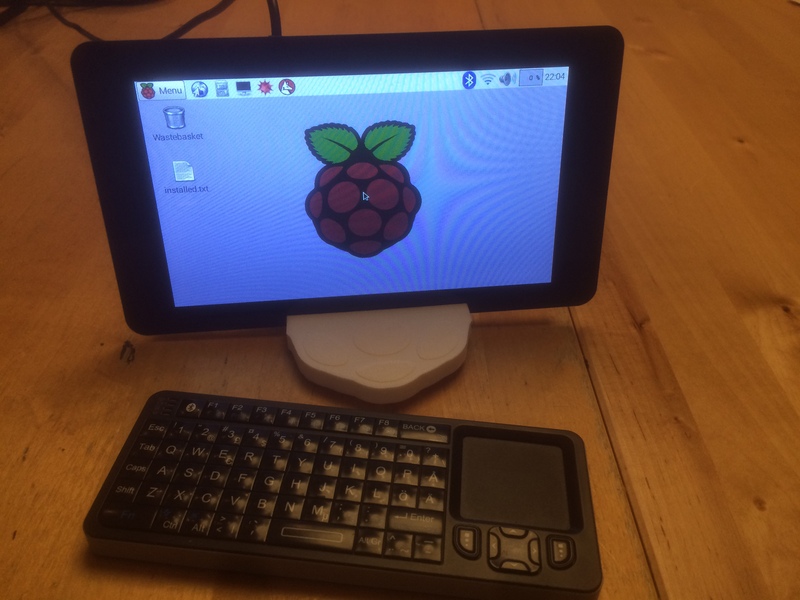 My shiny new RasPI touchscreen. With the docker kernel it was pitch black! I could make a script that sends the IP address as an email, no? Well. I don’t like to leave my username and password on the PI. Neither do I want to have the mailbox spammed with IP addresses. MQTT to the rescue! MQTT is a IoT-friendly protocol with a lightweight footprint. The clue here is to use a public MQTT broker – in my case mqttdashboard.com – so that both the RasPi and my mac could reach it. Mosquitto is an obvious choice here, with excellent community support. First, test and select a public MQTT broker that you can reach from both the PI and your laptop. /usr/bin/mosquitto_pub -h $MQTTHOST -t "$MQTTPREFIX/$RPINAME/$IFC/ip" -m "$PRIVATE"
The /etc/rc.local script allows you to insert commands that run after a reboot. I added three lines at the end, so that it reports the address of the interfaces that I can think of. Remember to use «sudo» when you edit it..
mosquitto_sub -v -h <<MQTT BROKER OF CHOICE>> -t "yourname/#"